The latest in a continuing series of research studies strongly suggest that steel auto body structures in the near future can be as lightweight as today’s aluminium bodies, while meeting all crash performance standards and at comparable cost of current steel structures. The studies also address critical manufacturing challenges, showing that car makers can form and fabricate sophisticated steel designs, thus accelerating implementation of this technology into production vehicles. 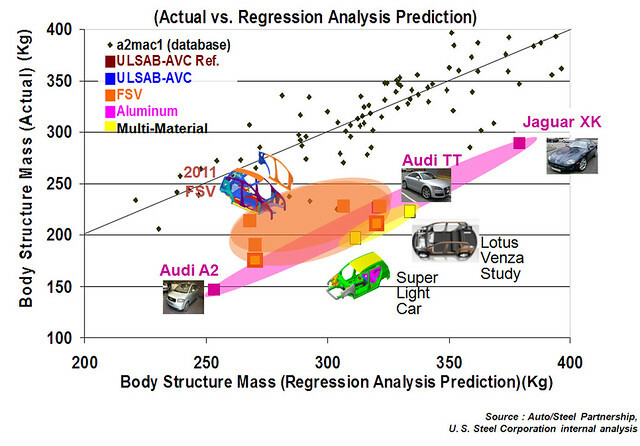 Adding to a weight reduction of 35 percent in its initial FutureSteelVehicle design, the steel industry’s most recent studies boost the mass savings to 39 percent, compared to a baseline steel body structure carrying an internal combustion engine, adjusted for a battery-electric powertrain and year 2020 regulatory requirements. The optimized FSV body would weigh just 176.8 kg, putting steel on par with today’s aluminium production designs. An industry database of current production vehicles (A2mac1) shows these light-weight, Advanced High-Strength Steel (AHSS) body structures, designed to carry heavier electrified powertrains, fall in line with the lightest internal-combustion-engine aluminium vehicles, and are on par with other concepts featuring multi-material solutions. The study results show that by incorporating FSV technology, car makers can avoid pursuing more costly alternatives involving competing materials and multi-material designs to achieve their goals. “Our latest light-weighting projects show the continuing potential of steel and demonstrate how car makers can take advantage of steel’s design flexibility and use Advanced High-Strength Steels (AHSS) to meet their difficult challenges for improving fuel economy and reducing green-house gas emissions,” said Cees ten Broek, Director, WorldAutoSteel, the automotive group of the World Steel Association. An industry database of current production vehicles(A2mac1) shows these light-weight Advanced High-Strength Steel (AHSS) body structures, designed to carry heavier electrified powertrains, fall in line with the lightest internal-combustion-engine aluminium vehicles, and are on par with other concepts featuring multi-material solutions. The two most recent studies, called “FSV Final Gauge Optimization” and “FSV Near-Term Front Longitudinal Rail Shape” streamlined the FSV design and devised alternative geometry (for the front rails), respectively. The former led to an additional mass reduction of 11.6 kg, compared to the initial FSV design, bringing the total weight savings to 39 percent. The latter validates two different, but comparable, front rail designs, expanding the range of solutions available to car makers in the near term. The first study following announcement of the FSV in May 2011 was 3B (Draw Bead, Blank Geometry and Binder Pressure) Forming and Crash Optimization. It resulted from continuing development of the Multi-Disciplinary Optimization (MDO) Process that enabled the “Nature’s Way” design used in FSV and solved the remaining forming issues presented by the FSV’s unique Front Rail structure. Through this design optimization work, the very efficient, light-weight Front Rail design is now a viable option for future production vehicles. Further, with the addition of the 3B Forming Process, the optimization software now fully comprises solutions to AHSS formability issues. Intensive use of AHSS, as the FSV demonstrates, also contributes to lower total green-house gas emissions over the entire vehicle life cycle, compared to higher cost, more energy-intensive low-density materials. Through this advantage in lower total life cycle emissions, steel use is consistent with a growing movement toward regulations that comprehend all sources of emissions, not only those from the vehicle-use phase. The FSV programme developed optimised AHSS body structures for four proposed 2015-2020 model-year vehicles: battery electric (BEV) and plug-in hybrid electric (PHEV) A-/ B-Class vehicles; and PHEV and fuel cell (FCEV) C-/D-Class vehicles. 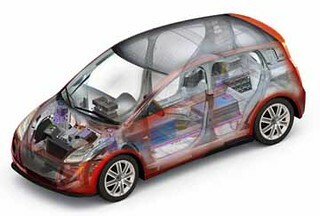 Though FutureSteelVehicle’s development focused on electrified powertrains, the design and material advancements are equally applicable for any type of automobile. The FSV programme employs more advanced steels and steel technologies in its portfolio and consequently adds to the tool sets of automotive engineers around the world. It uses more than 20 new AHSS grades, representing materials expected to be commercially available in the 2015 – 2020 technology horizon. The FSV material portfolio includes dual phase (DP), transformation-induced plasticity (TRIP), twinning-induced plasticity (TWIP), complex phase (CP) and hot formed (HF) steels, which reach into GigaPascal strength levels and are the newest in steel technology offered by the global industry. These steels answer the call of automakers for stronger, formable steels needed for lighter structures that meet increasingly stringent crash requirements. They are evidence of steel’s continual self-reinvention to meet automotive design challenges. Steel’s design flexibility enables the best use of the award-winning, state-of-the-future design optimisation process that develops non-intuitive solutions for structural performance. The resulting optimised shapes and component configurations often mimic Mother Nature’s own design proficiency, which allows engineers to place specific materials precisely in the structure to most efficiently meet structural and strength requirements for managing vehicle loads.